Progress has continued steadily on a few different areas of layout construction. 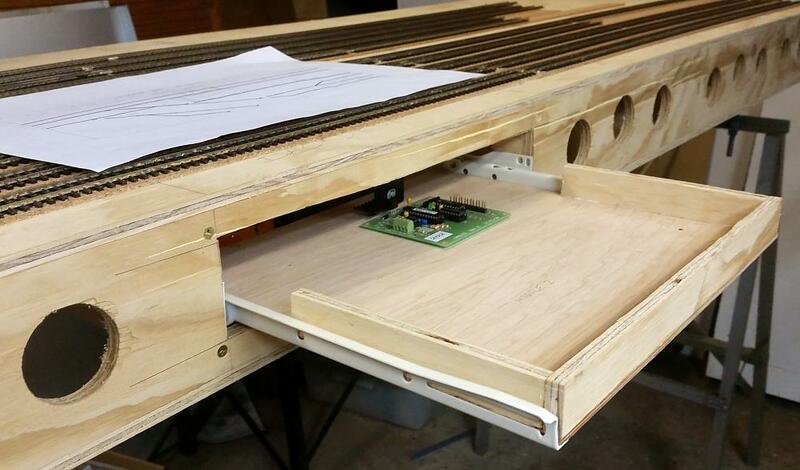 Drawers for the control panels on the front two modules were constructed out of 4.5mm plywood bases and 9mm ply sides. These were glued with PVA and nailed together before having drawer runners screwed underside. Openings in the module sides were cut with a jigsaw before the other half of the drawer runners were screwed onto the module cross-members. The control panel drawer for the front module hosting the yard and goods shed, in an open position. Space has been left behind the panel for mounting the layout control circuit boards connecting to the switches and LEDs. After the drawers were completed and fitted, Tortoise point motors were fitted to all the points on the front two modules. To mount them we move the motor arm to the centre position and hold the point blades in the middle of their travel to align them, then mark the locations for the small self-tapping screws that secure the motors. Once screwed into place, the point blade travel is individually tested by carefully moving the motors by hand and adjusting the pivot points to provide sufficient tension of the blades against the stock rails. The large L-shaped component of the main station building been clad in styrene and corrugated cardboard, ready for the next stage of fitting windows and doors before detailing commences. Most of the other parts of this station building have been finished with plastic brick sheet to a similar stage, with some Tichy moulded plastic windows mounted. Cutouts have been made for the 3D printed items, which have been given two coats of paint. The paint has helped bring out the intricate shapes of the details available using this medium, as well as disguising the lines associated with the printing process. The partially completed portions of the main station building laid out on one of the front modules. Cutouts for the 3D printed arched windows can be seen in the walls on either side of the building centre, which is yet to be started.